Trained In-Service Teachers working in Government recognized schools in Telangana State. Candidates who have completed a NCTE recognized Teacher Education programme such as TTC/D.Ed or any other course through face to face mode. Passed any Bachelors Degree i.e. BA/B.Com/B.Sc or any other Graduate course securing atleast 50% aggregate marks. However, for candidates belonging to the reserved category i.e. SC/ST/BC and other reserved categories who have secured 40% marks in the qualifying examinations are eligible. Candidates with B.Sc who have studied Physics and Chemistry or material sciences under Part-II group subjects or BCA candidates with Physical Sciences (Physics and Chemistry) at Intermediate level as group subject. All candidates with BA/B.Com/BBM and BBA candidates with Social Sciences at Intermediate level as group subject. Rs.20,000/- per annum [(B.Ed. ODL) first year – Rs.20,000/- and B.Ed (ODL) second year Rs.20,000/-]. The candidates have to pay the course fee through online. The duration of the B.Ed (ODL) programme shall be of 2 years. However, students shall be permitted to complete the programme within a maximum period of 5 years. The commencement and completion of the programme shall be so regulated that 2 long spells of vacation (Summer / Winter) are available to the learners guided / supervise instruction and face to face contact sessions. Admissions shall be made on the basis of the service seniority to the extent of sanctioned intake of 500 seats and the Reservation policy of the Govt. of Telangana will be followed. The allotment of the seats for the different categories of students will be made as per the guidelines given by the School Education Department, Govt. of Telangana through G.O.Ms. No.13 dt. 27.05.2017. The candidates seeking admission into B.Ed (ODL) programme has to register for the course through online by paying Rs.500/-. 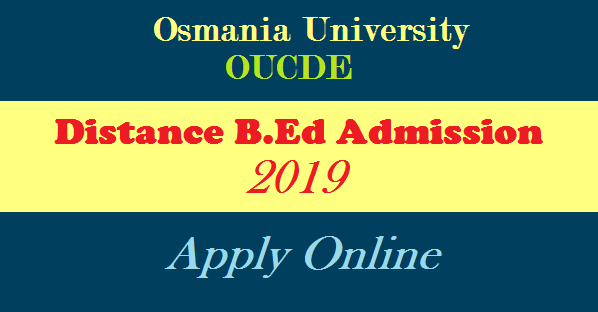 For online registration visit our website www.oucde.net. After registration the candidates are requested to take print out of Filled-in Online Application form and submit the same at PGRRCDE, OU by enclosing the required certificates (Xerox copies only).